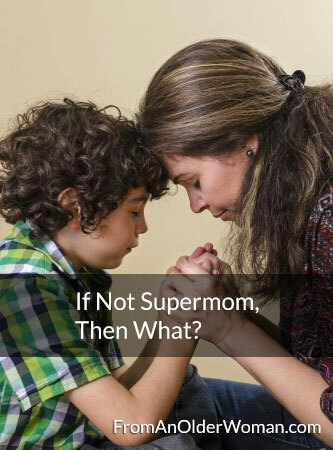 If Not Supermom, Then What? I don’t know about you, but when we were raising our children, I really wanted to be Supermom! I tried and tried, only to be disappointed in myself over and over again. But, as I mentioned last week, Supermom doesn’t exist! During one of the times when I was beating myself up for not being the perfect mother, God gave me a special time in His word. He blessed me by leading me to some specific scriptures that helped me understand that I didn’t have to be Supermom and that He had the answers for me. I share these with you in hopes that they can be an encouragement to you as they were to me. I pondered, what was the work of my hands? I cleaned house and cooked and taxied; I nursed and grocery shopped and so on. But I realized that the work of my hands that I most wanted God to establish was the raising of my children. But I was such a failure! I was a bad example so often! I knew that I was not able to be that perfect mother that I thought they needed. The steps of a man are established by the Lord and He delights in his way. When he falls, he shall not be hurled headlong; because the Lord is the One who holds his hand. I immediately pictured a young child holding her daddy’s hand, walking across an asphalt parking lot. She may trip and bump her knee, but because her daddy has hold of her, she isn’t “hurled headlong” or extremely hurt. I realized that God was telling me that as long as I held onto my Father’s hand as I walked through this life, I too would not be hurled headlong or destroyed. What I believe that God was telling me was that I could plant and water, I could do all that I could, but the results are in His hands. Even if I could be the perfect mom, my children wouldn’t be perfect, because they are sinful human beings. And I wasn’t going to be the perfect mother, because I am a sinful human being also. Therefore, I needed to spend more time before the throne of God, praying for my children and praying for His strength and wisdom (see James 1:5). God will confirm the work of your hands. Your steps should be ordered by God, and He will hold your hand and keep you from ruin. It is God, not us, who causes the growth.